The vast spectrum of Interventional Pulmonology (IP) spans from preventative to palliative medicine. Interventional Pulmonology offers cost effective, out-patient, and minimally-invasive diagnostic and therapeutic strategies for chest diseases. Examples of such interventions include lung cancer diagnosis and staging with minimally invasive approaches such as Endobronchial Ultrasound (EBUS) and navigation technologies. Similarly, from the therapeutic aspect, examples include management of complex airway strictures and stenoses with rigid bronchoscopy and airway stenting as well as treatment of severe emphysema with Bronchoscopic Lung Volume Reduction (BLVR) with novel devices such as airway valves and coils. IP also has dramatically changed how we manage complex pleural effusions in this day and age with indwelling pleural catheters and medical pleuroscopy. The brisk progress of IP over the last 15 years has expanded its horizons beyond anyone's wildest imagination. Millions of patients with a broad spectrum of pulmonary diseases benefit from the cutting-edge diagnostic and therapeutic approaches offered by IP around the globe. Some of the current clinical studies and device trials underway include bronchoscopic ablative therapies utilizing navigation technology and manually created tunnels through the lung parenchyma, robotic devices allowing multiple instruments to operate simultaneously in the airways, bronchoscopes with multiple working channels, and steerable and trackable instruments. IP has already shifted decades-old diagnostic and therapeutic paradigms in many areas of pulmonary diseases. The relentless progress in technologies and skills of IP physicians undoubtedly carries the promise to revolutionize the field of pulmonary medicine. 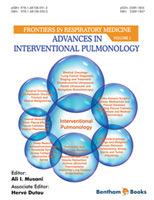 Finally, I am incredibly thankful to my associate editor and good friend, Dr. Herve Duatau and all the contributing authors who volunteered their precious time and expertise in writing evidence-based, state of the art review articles for this edition of Clinics in Chest Medicine on Interventional Pulmonology. I would like to thank my wife Lubna Sorathia and our children Sara and Sef for allowing me to pursue my ambitions by sacrificing their needs. They allow me to dedicate a major portion of my life to many academic endeavors. Their support and love make it all possible.